Oh, those are so pretty!! 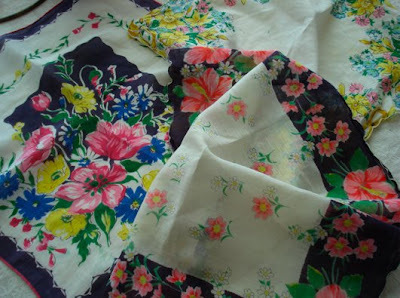 I love to carry hankerchiefs and pick them up at the antique store. They don't make them like that anymore, do they? Did your mom collect them, or use them / carry them? She used them. One of them, but I can't remember which one, was all crumpled up in the pocket of the dress I wore to her funeral. All of us girls wore one of her denim dresses. Oooh, how pretty! I love old hankies also. My mom still uses them ... Kleenex seem wasteful to her. Do you have them out as decor somewhere?